“If I had agreed to enrol Disan in the Community Based Management of Acute Malnutrition (CMAM) program earlier, he would have gotten healthy faster,” said Yustina Tallo, mother of 15-month-old Disan Tallo, in a small village in East Nusa Tenggara Province. 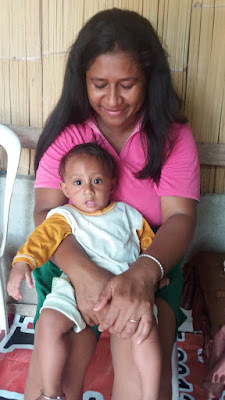 Yustina still feels guilty remembering how she rejected the diagnosis of ‘severe acute malnutrition’ by health workers at the puskesmas, or local community health centre, just a few months back. She found it difficult to believe them; though Disan was often sick with flu, diarrhoea and fever, she was confident he was, at root, just as healthy as his 8- and 5-year-old siblings. UNICEF is working with the Ministry of Health, local government authorities and Action Against Hunger to educate parents about the link between good nutrition and growth, and to bring counselling services from health centres directly to the homes of children in need. These initiatives form the core of the CMAM model. In Disan’s case, Yustina was already 12 weeks pregnant when she found out she was carrying a child. He was born premature, weighting just 2.1kg at birth. For the first six months, Disan was exclusively breastfed. Then Yustina began adding complementary foods like porridge and soft vegetables. But Disan fell ill often, and trips to the puskesmas became nearly routine. During these visits, health workers told Yustina that Disan was likely suffering from severe acute malnutrition, for which the foods he was eating were an insufficient remedy. Eventually, after two months, they persuaded her to enrol Disan in the CMAM programme. As a first step, Disan was given Ready-to-Use Therapeutic Food (RUTF), a peanut-based paste enriched with essential vitamins and minerals. However, shortly after starting the feeding programme, Disan fell sick. Yustina blamed the RUTF, and subsequently discontinued the programme. After a few weeks, health workers noticed Disan wasn’t gaining weight. In line with the CMAM mandate, health workers visited Yustina at home and coached her on the benefits of RUTF, explaining that Disan’s sickness was not related to the RUTF but was a symptom of another illness. After repeated visits from health workers and Action Against Hunger employees, Yustina agreed to see the programme through. Soon, Disan began gaining weight, which motivated his mother to bring him to the puskesmas for weekly visits. Today he has mounted a full recovery, and is a happy, healthy, energetic young boy. “I cannot imagine the result if I had ignored treatment for Disan,” she says. For Yustina, the CMAM programme is a new hope for families with severe acute malnourished children. “I can’t say enough about the health workers who never gave up trying to convince me to enrol Disan in the CMAM programme, and who did home visits to motivate me to feed him appropriately and provide continuous counselling,” she said. With the grassroots health initiative now in full swing, more and more children like Disan will be reached with lifesaving nutrition support through the CMAM programme.